Halona Blowhole, O`ahu. 15 ft.
A few weeks ago my friend Ron Holcom called to tell me about some strange animals he had found in a cave. He described them as overgrown limpets about the size of a fist. 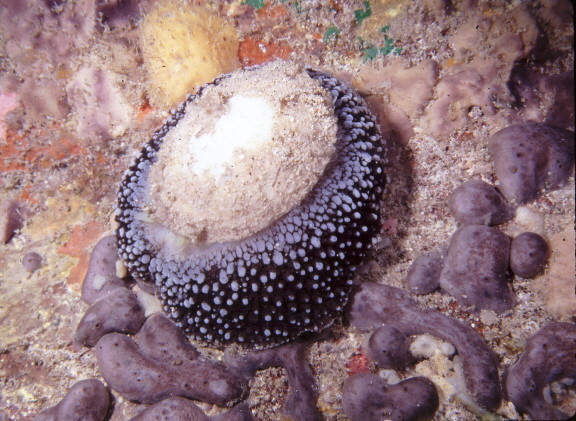 A flat calcereous cap barely covered the body, which was black covered with white warts. Ron, who knows his marine critters pretty well, admitted he was puzzled. I suspected they might be umbrella slugs. I had read about these bizarre animals and in fact had been looking for them for years. I badly needed a photo for my upcoming book on Hawaii's marine invertebrates. The following Sunday Ron and I drove out to Oahu's Halona Blowhole where the cave was located. Luckily, the sea was calmer than usual on the the southeast side of the island that day. I knew that cave, and under normal wave conditions, I wouldn't have wanted to get anywhere near it. Situated at one end of a shallow underwater ravine, its huge funnel catches the surge and channels it upward through tortuous crevices until, under tremendous pressure, water jets out from the cliffs above in a fountain of spray. Underwater, air compresses in the recesses of the cave and explodes back, causing shock waves--deep, powerful thuds that resonate in your chest. It feels like your heart is skipping beats and your depth gauge goes wild. On the walls of this spooky cave grow meandering multicolored sponge formations--perfect slug territory. Entering the water off the tiny beach (made famous in the movie "From Here to Eternity"), we swam out a short distance and submerged. The cave entrance was only 5 minutes away at a depth of about 15 feet. Cautiously we entered and sure enough, high up on the wall of the left side were two umbrella slugs grazing on the sponges. Near the largest (about 3 inches across) was a white egg coil the same diameter as the animal. Swaying back and forth in the surge, trying to ignore the heart-stopping thuds I snapped picture after picture from every angle and at every exposure until Ron signaled that we had better get out while the going was good. This cave was not a good place to be if a large rogue wave came through. The rest of the dive was uneventful, but it's still a dive I'll not soon forget. Thanks, Ron! Author/photographer John P. Hoover lives in Honolulu. He has published two books on marine life of the Hawaiian Islands and is working on his third, a field guide to the marine invertebrates of Hawaii covering over 500 species. © The Slug Site, Michael D. Miller 1998. All Rights Reserved.